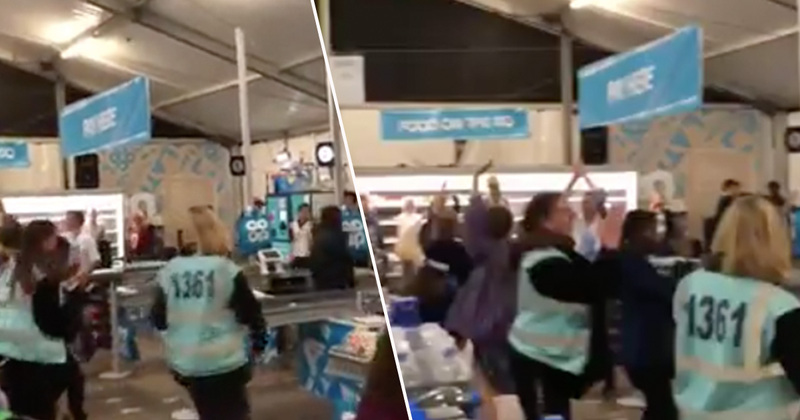 A supermarket is the last place you’d expect to hold a rave but in 2018 anything is possible and now the Co-Op will be setting up pop-up shops so festival goers can throw-up shapes down the dairy aisle. Logistically, a supermarket is the ideal space for a rave, it has the capacity, plus all your needs, such as booze and a decent sound system. Furthermore, the best festivals, as fun as they are, are usually held in the middle of nowhere. Where civilisation is nowhere to be found for the next hundred miles. Which is why it’s a godsend the Co-Op have partnered up with Live Nation to become the first UK food retailer to have a supermarket at four major music festivals this summer. If you happen to be heading to Download, Latitude, or Reading and Leeds festivals this summer, no longer will you have to stuff your backpack full of food, drinks and bog roll. Instead, you ‘ll find all you need at one of the Co-Op pop-up stores at each all four festivals. The deal will see Co-Op open up a 6,000 square foot shop at each of the four festivals to serve the needs of 200,000-plus festival goers in the UK. Each store will be stocking a wide range of items, including food, water, beer and wine, toiletries including medicines and, to cover all eventualities, both sun cream and rain ponchos! But the most important thing they’ll have is toilet roll, the festival equivalent of a golden ticket to Willy Wonka’s chocolate factory. This industry-first deal puts Co-Op at the heart of festival communities this summer. It shows our ambition to reach out to new and younger customers, providing essential and quality products. Co-Op is all about being close to the customer and it doesn’t get much closer than being right outside your tent. We want festival-goers to have the best possible experience while at our events and are always looking for partnerships that enhance this. Having an environmentally-conscious food retailer like Co-Op onsite will give fans easy access to all the products they need while at our festival campsites, while reinforcing our green principles. We look forward to working closely with Co-Op throughout the summer. Co-Op’s press release goes on to claim that each festival store will stock over two hundred essential products and which will be replenished daily. The stores will open from 7AM until 1AM, and will be located in the campsite area of each festival to make it easier to get to and stock up. This also means festival goers will no longer fall for troll-tastic pranks such as the one performance artist Douglas Bevans carried out at a festival in Vancouver, Canada. Bevans tricked attendees at a yearly car-free event by flogging them selling bottles of Hot Dog Water for an astonishing $40 each. Promoting himself as the CEO of Hot Dog Water, Bevans said his stunt aimed to see how the marketing of health claims backed by supposed scientific evidence impacted on sales.